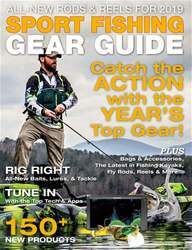 The annual Sport Fishing Gear Guide is devised to help you choose “all the right stuff” to enjoy the pastime of fishing. Whether you want to try the latest rod and reel from your favourite manufacturers or test some new lines and lures for the season, the choice is yours and the choices are aplenty! We reached out extensively to various manufacturers over the last few months to present you with a solid selection of some of the top gear for 2019.